Schnabel had an exhibition at the Art Gallery of Ontario in Toronto, which ran from September 1, 2010 to January 2, 2011 and occupied the entirety of the gallery's fifth floor. It examined "the rich interplay between Schnabel's paintings and films". In 2011 Museo Correr exhibited Julian Schnabel: Permanently Becoming and the Architecture of Seeing, a selected survey show of Schnabel's career curated by Norman Rosenthal. Art critic Robert Hughes was one of the most outspoken critics of his work; he once stated that "Schnabel's work is to painting what Stallone's is to acting: a lurching display of oily pectorals." In the 2017 Swedish film The Square, set in a museum of modern art, Dominic West plays a character modeled on Schnabel. In 2007, Schnabel designed Lou Reed's critically acclaimed "Berlin" Tour and released Lou Reed's Berlin. In 2010, Schnabel then directed the film Miral. In May 2017, Schnabel announced plans for a film about the painter Vincent Van Gogh during his time in Arles and Auvers-sur-Oise, France. The film At Eternity's Gate was released in 2018 and the script was written by Schnabel, French screenwriter Jean-Claude Carrière, and Louise Kugelberg. The film stars Willem Dafoe as Van Gogh. Other actors include Mathieu Amalric, Mads Mikkelsen, Niels Arestrup, Oscar Isaac as Paul Gauguin and Emmanuelle Seigner as "the woman from Arles" or L'Arlésienne. His works are exhibited in the collections of various museums throughout the world, among them the Metropolitan Museum of Art; Museum of Modern Art in New York; the Whitney Museum of American Art; the Museum of Contemporary Art (MOCA), Los Angeles; Los Angeles County Museum of Art; Reina Sofia in Madrid; Tate Modern in London and the Centre Georges Pompidou in Paris. ^ Anne Thompson (2017-05-23). "Willem Dafoe as Vincent Van Gogh in Schnabel's Biopic: Exclusive Photo". IndieWire. Retrieved 2019-03-14. 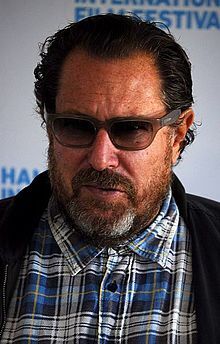 ^ "AFM: SPK Pictures to Finance New Films From Julian Schnabel, Harmony Korine (Exclusive)". Hollywood Reporter. 2017-11-02. Retrieved 2019-03-14. ^ "Rula Jebreal Photos Photos - Julian Schnabel Opening Exhibition - Arrivals - 54th International Art Biennale". Zimbio. Retrieved 2019-03-14. ^ Chris Rovzar (2011-08-15). "Julian Schnabel and Rula Jebreal Have Broken Schnup". Nymag.com. Retrieved 2019-03-14.